Congratulations! You just finished a half marathon(or a full marathon if you’re really ambitious). Now what are you going to do. The first instinct is to find the closest area of soft grass and collapse. And when you make it home the couch is calling your name. So you slump into it and binge watch tv for the rest of the night. Unfortunately that's a very bad idea my friend! So here’s your half marathon recovery plan. You probably took extensive time preparing for this race. Some of you may of even followed a 20 week half marathon training schedule so you knew you’d be able to say my first half marathon was great. So it just makes sense to have a post recovery run plan. We’ll let you know what do from once you cross the finish line to when you lay your head down on that pillow. However recovery will not be exactly the same for everyone. Variations will depend on how long you’ve been running, how physically fit you are and your nutritional requirements. But following these suggestions will allow for a quicker recovery and overall better race experience. 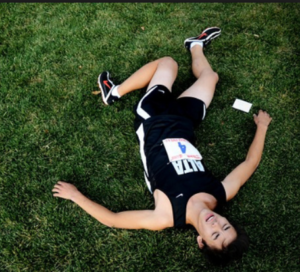 We’ve all seen runners who sprint across the finish line then fall to the ground in exhaustion. It’s crucial for you to stay upright and walk (I know your legs feel like lead weight) for at least 15-20 minutes so your heart rate can slow down. This is called active recovery and will keep muscles from stiffening up and lower the risk of pulling a muscle. During the race, lactic acid builds up and will cause soreness later. By walking you help to eliminate this metabolic byproduct. Here’s another reason to keep your body in motion. During the race your heart is frantically pumping blood and oxygen to your muscles to keep them working. Stopping suddenly will cause blood to pool in your lower extremities which in turn lowers blood pressure. This will cause you to feel dizzy, light-headed and you could even pass out. Since races are usually on Sunday, some runners fly in for the weekend and leave on the day of race so not to miss work. Unfortunately it’s ill advised to fly or drive long distances shortly after a race. After you’ve gotten your lovely post race picture taken, re-hydration is a priority. 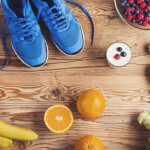 The rule of thumb is 16-20 ounces per pound of weight lost during the race. Of course this is difficult since there isn’t a scale at the start and finish line. So try for 16-20 ounces right after the race and repeat every hour until you’re hydrated again or when you urine is light yellow. It’s also important to replace the electrolytes your sweated out during the race. Sports drinks are an easy way to do this. In addition BCAA’s are great for repair and recovery and can be added to water The amount you need depends on the conditions of the race. Distance , temperature and humidity will determine how much you need. Again when in doubt go by the urine test. Next give your hamstrings some TLC: Lie down on your back and keep the left leg on the ground. Take both hands and grab the right leg behind the knee. Then pull the knee to the chest and hold for 30 seconds. Repeat on opposite leg. I’m sure you’re on board with this so plan ahead. Almost all races allow you to check gear at a designated area before the race. Bring dry or warm clothes depending on the temps and conditions outside. Staying in sweaty clothes traps bacteria to the skin and can cause breakouts or even worse infections. If the temperature is cold for the race, grab one of those shiny thermal blankets at the finish line. You may not think you need this but trust me you don’t want to be shivering in wet clothes when the adrenaline wears off. Yes I know they’re not the most fashionable addition to your outfit but they do help. Evidence shows compression gear aids in circulation and helps to prevent blood from pulling into the lower extremities and causing swelling. This also reduces fatigue by helping to prevent lactic acid buildup. The benefits of compression socks far out weigh the look of them. Find a pair that goes up to your knee, put on after the race and wear until you go to sleep. I know you want to celebrate your accomplishment so if you must keep it to one. However expects recommend avoiding alcohol for the first 24 hours after the race while your body is getting back to normal. Since you’d probably never consider running after drinking alcohol the night, why do it afterwards. If you’re dehydrated and haven’t eaten, alcohol will enter the bloodstream faster and we know what this can lead to. Alcohol will also dehydrate you further and impede muscle recovery. But if you do partake in adult beverages stick to one and drink 20-24 ounces of water first. During the race blood flow is directed towards the working muscles and away the digestive tract. The body needs time to recover and redirect blood flow to the proper organs. So stick to a low fat, low fiber meal that is easy to digest to avoid an upset stomach. You want to consume a meal with a 4:1 ratio of carbs to protein within 60 minutes after the race. If you can’t handle solids foods than chocolate milk is a great alternative. Carbs are definitely the most needed. But protein is also important in helping with muscle repair and recovery. Well I guess if you like that sort of thing. Expects recommend a magnesium and Epsom salt bath the evening after the race. It can help detox the body and is soothing to the muscles. Others suggest an ice bath to get rid of the lactic acid buildup and reduce soreness. If baths aren’t your thing then do some easy stretches before you hit the hay. 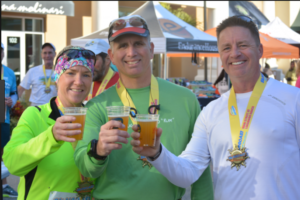 You’re probably not planning on running the next day(unless you’re part of the marathon maniacs and that’s a whole different story). Take it easy for a few days from most activities. The amount of time you need to recovery varies based on your age, your running experience and how hard you ran. Some say take one day off for every mile raced. That might seem too much so ideally forgo strenuous workouts or runs for 2 weeks. When you do start running again don’t expect to be in the same condition you were before the race. Finally, it’s of the utmost importance to listen to your body. Runners can experience delayed onset muscle soreness (DOMS) lasting several days. When this occurs exercise must be avoided until the condition goes away. Then try low impact workouts like biking or swimming before you lace up those running shoes. Pushing your body before it’s ready will increase your risk of injury and it’s just not worth it. So give your body the rest it needs and enjoy your accomplishment.